مومیوند, محمد, محمدخانی, حسن, حیدری, جواد, واعظی, سیدمحمدحسین. (1396). بررسی پارامترهای تأثیرگذار حل عددی در محاسبه ضریب میرایی چرخش. علوم و فناوری فضایی, 10(2), 65-72. محمد مومیوند; حسن محمدخانی; جواد حیدری; سیدمحمدحسین واعظی. "بررسی پارامترهای تأثیرگذار حل عددی در محاسبه ضریب میرایی چرخش". علوم و فناوری فضایی, 10, 2, 1396, 65-72. مومیوند, محمد, محمدخانی, حسن, حیدری, جواد, واعظی, سیدمحمدحسین. (1396). 'بررسی پارامترهای تأثیرگذار حل عددی در محاسبه ضریب میرایی چرخش', علوم و فناوری فضایی, 10(2), pp. 65-72. مومیوند, محمد, محمدخانی, حسن, حیدری, جواد, واعظی, سیدمحمدحسین. بررسی پارامترهای تأثیرگذار حل عددی در محاسبه ضریب میرایی چرخش. 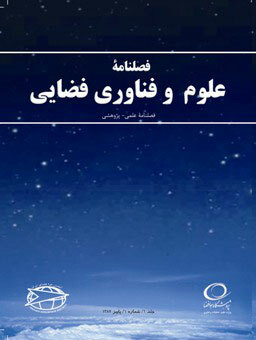 علوم و فناوری فضایی, 1396; 10(2): 65-72. به‌دست آوردن ضرایب آیرودینامیکی و مشتقات کنترل و پایداری نقش مهمی را در طراحی وسایل پرنده ایفا می‌نماید. بیشترین کاربرد این ضرایب در شبیه‌سازی مسیر پروازی و تعیین تغییرات سرعت دورانی راکت و طراحی سیستم هدایت و کنترل پرنده‌های هدایت‌شونده می‌باشد. در این مقاله، به نحوة محاسبة ضریب دمپینگ چرخش مدل استاندارد بِیسیک فینِر در ماخ‌ها و زوایای حملة مختلف با استفاده از روش عددی شبکه سرشی پرداخته شده است. همچنین، اثر پارامترهای تأثیر گذار مانند دامنه و دورة تناوب (فرکانس) نوسان، گام زمانی حل عددی و تعداد تکرار در هر گام زمانی برای تعیین ضرایب میرایی گشتاور چرخش بررسی شده است. مدل‌سازی و شبکه‌بندی هندسه توسط نرم افزار آی سی اِم سی‌اف‌دی و تحلیل جریان به‌وسیلة نرم‌افزار انسیس فلوئنت انجام شده است. در این شبیه‌سازی از معادلات جریان اویلر، تراکم‌پذیر و ناپایا استفاده و برای حل عددی از روش حجم محدود و حل‌کنندة بر مبنای چگالی با فرمول‌بندی صریح و دقت مرتبة اول بهره گرفته شده است. برای ارزیابی صحت نتایج حاصل از روش عددی، مقایسه‌ای با داده‌های تست تجربی و کد مهندسی MD صورت گرفته است که نشان می‌دهد، نتایج به‌دست آمده از دقت خوبی نسبت به داده‌های تجربی برخوردار است. experimental data and MD results, indicating that the results have a good accuracy. Visbal, M.R., “Effect of Compressiblity on Dynamic Stall of Pitching Airfoil,” AIAA Paper, 1988. Lin, C.Q. and Pahlke, K., “Numerical Solution of Euler Eqution for Aerofoils in Arbitrary Unsteady Motion,” Aeronautical Journal, Vol. 98, Issue 976, 1994, pp. 207-214. Gaitonde, A.L. and Fiddes, S.P. “A Three- Dimentional Moving Mesh Method for the Calculation of Unsteady Transonic Flows,” Aeronautical Journal, Vol. 99, No. 984, 1995, pp.150-160. Gaitonde, A.L. and Fiddes, S.P. “A Dual-Time for the Solution of the Unsteady Euler Equation”, Aeronautical Journal, Vol. 98, Issue 976, 1994 , pp. 283-291. Batina, J.T., “Unsteady Euler Airfoil Solution Using Unstructured Dynamic Meshes,” AIAA Journal, Vol. 28, No. 8, 1990, pp.1381-1388. Regan, F.J., Roll Damping Moment Measurements for the Basic Finner at Subsonic and Supersonic Speeds, NAVORD Report 6652, U.S. Naval Ordnance Laboratory, March 1964. Uselton, B.L. and Leroy, M.J., “Experimental Missile Pitch and Roll Damping Characteristics at Large Angles of Attack,” Journal of Spacecraft and Rockets, Vol. 14, No. 4, 1977, pp. 241-247. Oktay, E. and Hasan, U.A., “CFD Predictions of Dynamic Derivatives for Missiles,” AIAA Paper, Vol. 276, 2002, pp. 14-17. Murman, S.M., “Reduced-Frequency Approach for Calculating Dynamic Derivatives,” AIAA Journal, Vol.45, No. 6, 2007, pp. 1161-1168. Hyung Park, S., Kim, Y. and Hyuk Kwon, J., “Prediction of Dynamic Damping Coefficients Using Unsteady Dual-Time Stepping Method,” 40th AIAA Aerospace Sciences Meeting & Exhibit, January 2002. Shantz, Irving and Robert Groves, T., Dynamic and Static Stability Measurements of the Basic Finner at Supersonic Speeds, Technical Report NAVORD Report 4516, U.S. Naval Ordnance Laboratory, September 1960. Bhagwandin, V.A., Sahu, J., “Numerical Prediction of Pitch Damping Stability Derivatives for Finned Projectiles,” Journal of Spacecraft and Rockets, Vol. 51, No. 5, 2014, pp. 1603-1618. Xian-Xu, Y., Han-Xin, Zh. and Yu-Fei, X., “The Pitching Static/ Dynamic Derivatives Computation Based on CFD Methods,” ACTA AERODYNAMICA SINICA, Vol. 23, No. 4, 2005, pp. 458 – 463. Hashimoto, A., “Unsteady Analysis of Aerodynamic Derivatives on Standard Dynamics Model,” 51st AIAA Aerospace Sciences Meeting including the New Horizons Forum and Aerospace, Texas, USA 7-10 January 2013. Rasi Marzabadi, F. and Kamali Moghaddam, R., “Longitudinal Dynamic Derivatives of an Airfoil under Pitching and Plunging Oscillations in Wind Tunnel,” Modares Mechanical Engineering, Vol. 14, No. 10, 2014, pp. 159-166 (In Persian). Ye, Y., Zhao, Z., Tian, H. and Zhang, X., “The stability Analysis of Rolling Motion of Hypersonic Vehicles and Its Validations,” Science China Physics, Mechanics & Astronomy, Vol. 57, Issue 12, 2014, pp. 2194–2204. Fangjian, W. and Chen, L., “Numerical Prediction of Stability Derivatives for Complex Configurations,” Procedia Engineering, Vol. 99, No. , 2015, pp. 1561-1575. Liu, X., Wei, L. and Yunfei, Zh., “Navier–Stokes Predictions of Dynamic Stability Derivatives for Air-Breathing Hypersonic Vehicle,” Acta Astronautica1, Vol. 118, 2016, pp. 262-285.